I still find it amazing that things on our own door stop really make me stop and think “I love Rowley Regis”. I mean literally speaking of course – the stuff I find on my own actual door step usually makes me mad – you know the pizza/balti/fast food takeaway leaflets, taxi cards, charity bags and Bettaware catalogues etc. I’m talking about nice surprises for everyone in RR to enjoy. Take one delightfully sunny day in April – a big bonus as it was a Sunday and no work – always a joy to not work on a sunny day – me and a few select members of the Johnson crew went on a little walk to Warrens Hall via the canals (well the canal towpaths to be exact… felt I had to add that for health and safety reasons, wouldn’t want anyone to actually walk in the canal). 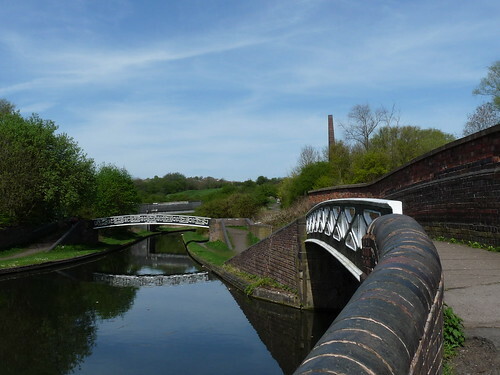 We started off from Powke Lane Public Open Space (in Powke Lane, Rowley Regis) and walked along the canal path to Springfield and Warrens Hall Local Nature Reserve. 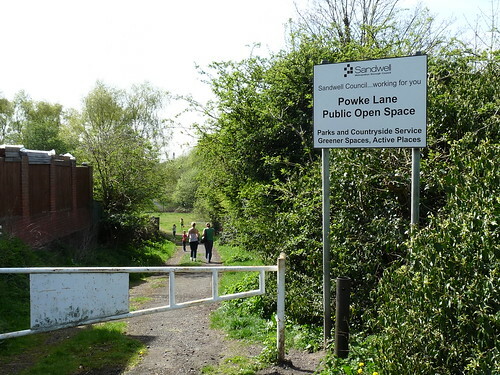 The Open Space in Powke Lane can easily be missed, my sister-in-law who had lived in the area for over 10 years had never heard of it let alone seen it. There’s plenty of green there stuck between industrial estate and over the road from the cemetry – a right little secret haven in Rowley Regis. From there we walked to Totnal Bridge and took a right along the canal path of the Dudley No. 2 canal to Warren’s Hall – it’s about 2 miles according to the mapping website I used to clock the distance and record the route. Along the way we saw a few ducks and geese – and fed them some bread, met some friendly canal folk (they didn’t want any bread) and had a few pit stops for the old and young of the expedition party to refuel. 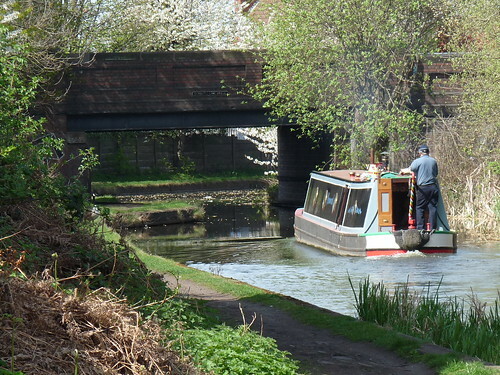 Once there it’s amazing what you find at Warrens Hall – another little hidden gem right on our doorstep – especially on a sunny day; canals, bridges, wildlife, pools, a big tunnel and – Cobb’s Engine House (see main photo above). We sat and had a picnic on the grass by the Engine House and Chimney – well, I say picnic – it was Fruitshoots, Hula Hoops and Haribos – what more do you need eh?… (sorry Jamie Oliver!). Cobb’s Engine House (properly known as Windmill End Pumping Station) in Rowley Regis, West Midlands, England, is a scheduled ancient monument and a Grade II listed building built around 1831. It housed a stationary steam pump used to pump water firstly from Windmill End Colliery and later other mines in the area. Utilizing a shaft 525 feet deep, 1,600,000 litres of water were pumped from the mines into the canal daily. It ceased work in 1928 and the Newcomen type engine was moved to the Henry Ford Museum in Dearborn, Michigan in 1930. I remember going to Warren’s Hall as a kid – as a pupil at Britannia High School with Jock Weir for one of his Outdoor Ed lessons, I used to love Outdoor Ed – probably my favourite subject at school and Jock was a pretty cool teacher too. We’d done abseiling and other cool stuff with ropes there – not sure if we abseiled down that big chimney or not but we did abseil something there – it was few years back and mind’s gone a blank. Also me and few mates had been through the Netherton Tunnel as kids; on foot and on bikes – walking was the scariest and it was usually a “dare” for one of us to go first – sometimes the handrail wasn’t there, one wrong move and we’d be in the cut – all cold, dark and wet . If I remember correctly the tunnel is 9,081 feet long (that’s 2,768 metres to you metric dudes) – actually I don’t remember at all – I cheated (but I guess you knew that) – good old Wikepedia again! All of this quiet greenery was once covered with industrial action, a hub of horses and workers. Factories, boat yards, coal mines, blast furnaces, iron works, timber yards, brick kilns and saw mills occupied the open spaces. There are many hidden clues and visible signs in Cobbs engine house, Timbers Gallows Crane and the Blow Cold Bank Colliery Spoil Heap. The canal basin once served for continual boat traffic ferrying coal from the pits. So – if you’re looking for a nice little walk (it’s over 4 miles if you walk back so will leave it up to you to decide if it is “little”) with nice scenery and a bit of history do what we did (map link somewhere above) and let us all know what you think, if you’ve got photos share them via Flickr, you can view some of the other photos from our walk on Flickr if you want.